During his last visit to Malawi in July, John Challis was invited by Rev Levi Nyondo, General Secretary of the Synod of Livingstonia, to visit Mzuzu prison where Levi had been held during the troubles in Malawi last year. Rev Nyondo spoke to the prisoners and pointed out the door of the cell where he had been held. John then gave a Tambuka Bible to each cell and then went on to the women’s section of the prison where there were 8 prisoners. 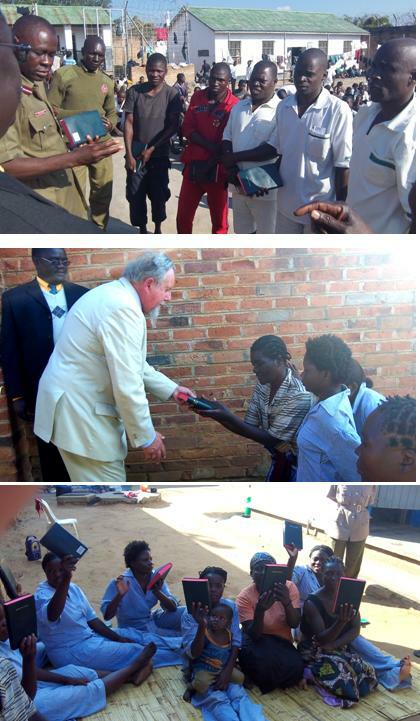 Each woman was given a Tambuka Bible. We have since heard that newly released prisoner has been in touch with the Mzuzu Evangelism Association and has asked for a Bible.